Today we are interviewing Elizabeth Bailey, author of the historical romance Hidden Flame. I love to read and lose myself in other worlds. Though I was born in England, I grew up in Africa and have travelled a lot. I adore bohemian clothes and artifacts, together with art and history. It’s no surprise I ended up a writer of historical romance. Sheltering from a violent storm, Benedict helps a woman in distress, who turns out to be his dying godmother’s companion. A shocking inheritance blasts friendship apart, and Theda has to confront the ghosts of her past. Will the blistering scandals of yesteryear keep Theda and Benedict forever divided? Or will the flame of love triumph? 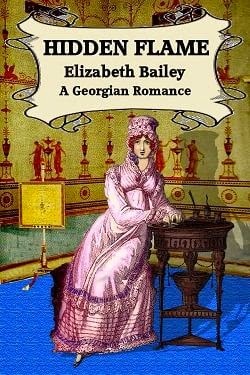 Anyone who loves historical romance and the Georgian and Regency period of history. What inspired you to write a novel in the tradition of regency romance? Growing up, I fell in love with the novels of Georgette Heyer and still enjoy her work. When I began to write, it felt natural to choose this genre. Tell us about the protagonists, Benedict and Theda. Benedict is a charming young rebel, driven by a need to redress the wrong done to his mother and thereby make his fortune. Theda is in hiding from her past, living a life as a companion which is unsuited to her fiery personality. What drives the attraction between Benedict and Theda? They are both outcasts and share a common bond of sympathy, but it is Theda’s concealed red hair that inflames Benedict and heightens the attraction. Lady Merchiston, the cantankerous elderly lady who is dying of cancer, and who Theda comes to serve. She is a complex character I loved creating. I’m planning the first in a series about Convenient and Cinderella brides, and this one will be set around Christmas. The sensuality is high, but actual sexual content is minimal. I write traditional clean romances but there is no less strength in the attraction between the hero and heroine. With a liberal hand, he poured himself another glass. But as he raised it to his lips the windows flashed bright again, and the heavens gave forth another stream of rumbling abuse. As if in response to his cursing, the wild night struck back at him, flaring a double blow of brilliant whiteness that seemed to tear at him through the windows. His head turned, eyes narrowing against the glare. As the room lit, an image crossed his vision—of a thin black figure seated in a corner, crouching witchlike in the gloom. His heart lurched sickeningly. The devil! He was seeing things. Too much brandy. But as the dark closed in again and his eyes began to adjust, the glimmering outline of a pale face encroached upon his senses. The thunder rolled away as Mr Beckenham stared, leaving the place eerily silent, and his heart still. Was it a ghost? Or merely his imagination playing tricks? Cursing briefly, he closed his eyes, looking away. As he opened them again, they flicked, almost out of his own control, to check. It was still there. Mr Beckenham froze. His fingers about the stem of his glass tightened. There was a sharp crack, and the broken glass fell from his hand, tinkling on to the table and spilling its golden liquid on to the pristine white cloth. ‘Hell and the devil!’ he swore, starting forward. There was a frightened gasp and the ghost rose, too, staring at him out of the two hollows that were its eyes.